March 2013, Qalandya, West Bank. 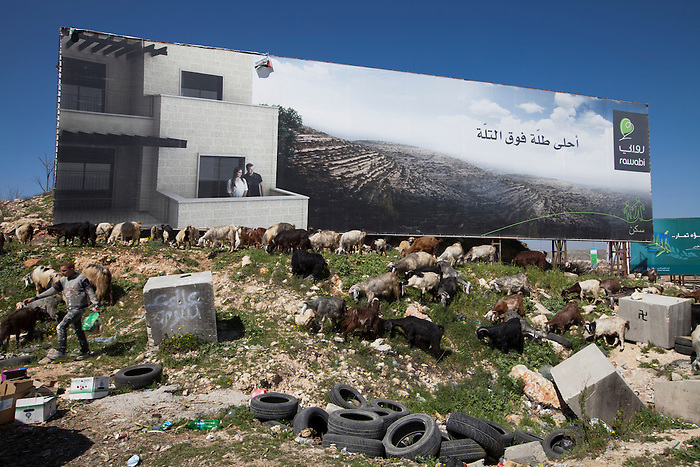 A Bedouin shepherded in front of a giant advert for the new planned city of Rawabi. In this area, controlled by the Israeli Army (C zone, 67% of the West Bank), there is no civilian control of the Palestinian Authority, since Oslo agreements of 1994. These urban zones therefore become chaotic with no civil management, criminal are pretty much free and trash is spread everywhere. The poorest populations are usually concentrated in the C zone, and amongst other the Bedouins are the people with most humanitarian issues in the West Bank.